"How can I get my hair to grow faster?" "Why am I losing hair?" "Why is my scalp so dry?" I hear questions like these on a near-daily basis. While I can recommend products to help aid these issues, the true fix to most hair issues starts with your internal health. Since hair is an inert material, both physical and mental health are at play here. If you’re a perfectly healthy person, you can blame your genes for the rate at which your hair grows. It's in your DNA. Hair loss, on the other hand, can be attributed to what you are consuming and your ability to cope with stress. Hair is not a vital organ; therefore, the body puts the least amount of priority on the hair. You have to actively pay attention to what you are consuming in order to signal your body to supply nutrients to your hair. If you don't maintain a balanced diet and can't seem to manage stress, issues will show up in your hair, skin, and nails. 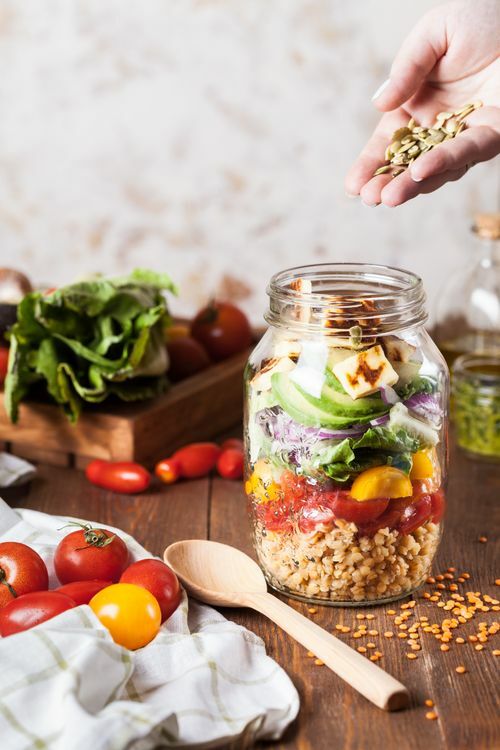 I've searched high and low on what to include in your diet as well as ideas to manage stress in order to get your hair on the road to health. Here, I'll break it down to you short and sweet. We'll start at the scalp. If you have dandruff, don't worry so does about 50 percent of the population in the US. For a healthy scalp, it's important to start with checking off your basic vitamins; A,C, and E. Some foods to start introducing into your diet are fish liver oil, leafy greens, and citrus fruits. And then, there’s WATER! You must consume water above anything else. The human body is made up of a lot of water. It only makes sense that if we don’t drink enough water, we’ll see it in the form of a dry scalp and ultimately, poor hair growth. Imagine trying to grow flowers without water. It just won't happen. Your hair will not properly grow if you are dehydrated. So, drink up! Moving onto the hair shaft. You need other vitamins like biotin, vitamins B-5, B-6, and B-12 to help prevent hair loss and benefit the hair shaft internally. Foods that contain these are: whole grains, brewers yeast, egg yolk, and vegetables. Here's one a lot of you can appreciate...CAFFEINE. That's right, sip your coffee and teas. Caffeine helps to decrease a follicle-damaging hormone called dihydrotestosterone. Another treat for you foodies is CARBS. Yes, that's right. Eat your carbohydrates. Your body uses the energy from them to convert proteins into cells for your hair. Healthy carbs include: whole grain toast, whole grain cereal, bulgar wheat, peas, parsnips, legumes, brown rice, oatmeal, and fresh fruit like bananas, pears, and apples. And, don’t forget to get your lean protein in. Hair is made up of 70-80% keratin, which is a protein. Low-fat and high protein foods are beneficial to incorporate into your diet. An example, skinless poultry, is high in Zinc and Iron. When these minerals are deficient in the body, it can trigger hair loss. Iron is one of the most vital minerals to consume due to its benefits not only for the hair, but for the heart and skin as well. If your hair seems to stop growing past a certain length or keeps falling out, it may be worthwhile to get your iron levels checked as there may be anemic issues at play. Another hair-loss cause is thyroid issues or stress which brings us to the mental side of hair health. If you find yourself in a constant state of mental disarray, your hair, skin, and nails will reflect that as well. Specifically speaking on hair, the more stressed out you are, the more likely you are to lose hair. The brain is a POWERFUL tool and if we are not taking care of the thoughts we think, the body reflects that. When you have high levels of stress, the body focuses on the priorities and protects only what it has to in order to survive. Sadly, hair is probably the least useful of organs according to our bodies; so, while personally we highly value it, our bodies are more concerned with using any remaining energy on protecting the vital internal organs. If you have a poor diet on top of being stressed, you can just say goodbye to having any hope for bountiful tresses. There are many helpful tools for managing stress. Just remember, that you are not alone. Sometimes we get caught up in our own situations and feel as if no one would understand. That can be very isolating. Talking to a trusted friend or therapist is a good place to start. Journaling is also a wonderful tool. Taking five minutes either before bed or after you get up each day to write a quick thought down can be therapeutic. Sometimes, we need to physically look at our issues on paper in order to see that they are a lot bigger and worse in our heads than in reality. It's also a small way to vent privately, if you feel like you’re burdening others when talking it out. Meditation is another wonderful way to love yourself. This also does not take more than a few minutes a day to take a break from anything you’re facing. It forces you to be alone with your thoughts and gives you a chance to escape, even if it's only for a short period. Lastly, exercise is one of the most efficient ways to de-stress. It releases endorphins which make the mind feel happy. Aside from it obviously being good for your bod, it's another chance to temporarily escape whatever it is you’re currently going through. I personally use it as a time to think about solutions to current problems. Engaging in any hobby is what everyone needs to find a little bit of joy in our crazy lives. So, to sum up in a few words: if you want luscious locks, eat right, stress less, and DRINK YOUR WATER. Disclaimer: Any recommendations made on this website or content herein are not intended to diagnose, treat, cure, or prevent any disease or condition. Furthermore, the information on this website are the opinions of the author and are not a replacement for medical advice. Please consult your health care provider regarding any health-related decisions. You are fully responsible for any actions you take and any consequences that occur as a result of anything you read on this website.